Diana, Princess of Wales, and Prince Charles stand with Bob Geldof in the Royal Box at Wembley Stadium at the start of the Live Aid charity concert in London, July 13, 1985. “Don't go to the pub tonight,” Irish pop musician Bob Geldof pleaded in the months leading up to Live Aid, the world’s biggest concert that took place on two continents, included 72 rock bands, and raised an estimated $125 million to feed starving Ethiopians caught in a historically severe famine. 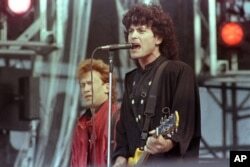 FILE - Eric Bazilian, lead singer of the The Hooters, performs during the Live Aid famine relief concert at JFK Stadium in Philadelphia, Pa., July 13,1985. 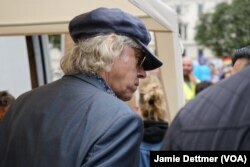 ​Geldof went to see for himself. In 1984, he organized “Band Aid,” writing and recording the single “Do They Know It’s Christmas,” and ended up raising about $10 million in famine relief. The song also became a hit in the United States, prompting “We Are the World,” a song written by Michael Jackson and Lionel Ritchie. Inspired by the success of Band Aid and with no end in sight to the famine, Geldof decided to expand the project, coming up with a total rethink on charitable giving. Why not, he asked himself, turn to his circle of wealthy rock 'n' roll pop stars to perform in a worldwide fundraising concert? ​It was the 1980s; it was the era of cable music channel MTV; digital entertainment didn’t exist. Given all that, Geldof’s vision was astoundingly ambitious — in fact, seemingly impossible. The event was held on July 13, 1985, simultaneously in London’s Wembley Stadium and Philadelphia’s JFK Stadium, raising more than $104 million that day. According to Billboard, an unprecedented 1.9 billion people watched the event live on television. Among the acts: Queen, Led Zeppelin, The Who, David Bowie, Madonna, Phil Collins, Sting, U2, Dire Straits, The Cars. The list goes on and on. The emotional high of Live Aid — its newness, its success in raising so much money to help the starving in Ethiopia — did not come without criticism. Several reports, including an investigation by Spin magazine and The Daily Mail newspaper, claimed some of the money intended to feed the hungry ended up in the hands of Ethiopian dictator Mengistu Haile Mariam. Geldof denied all the accounts. “Produce one shred of evidence, one iota of evidence, and I promise you I will professionally investigate it,” Geldof is quoted in the Mail report. “I will sue the Ethiopian government, who were the rebels at the time, if there is any money missing, for that money back now." Rock star Bob Geldof prepares to speak to the pro-European Union rally held in London, July 2, 2016.